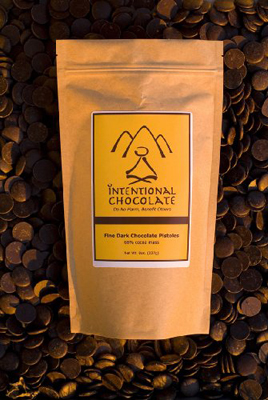 As if chocolate wasn’t a spiritual enough experience for me, I recently found out about Intentional Chocolate. 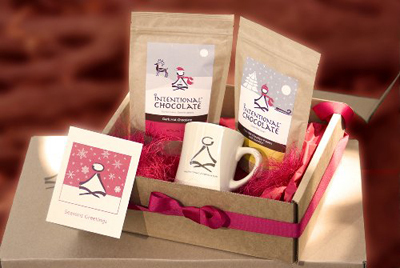 Get this: the chocolate comes infused with good intentions. 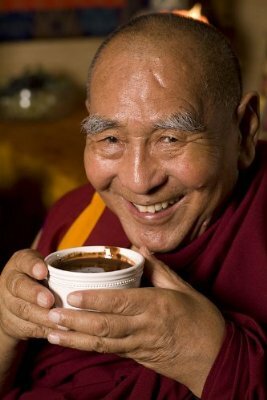 “Advanced meditators – some of whom trained with the Dalai Lama” add good intentions to each and every product. OK, that’s all really groovy but how does it taste? I tried the Love Truffles first. They come in a box of nine. There are three flavors (you get three of each): Tahitian Vanilla, Lilikoi, and Kona Coffee. 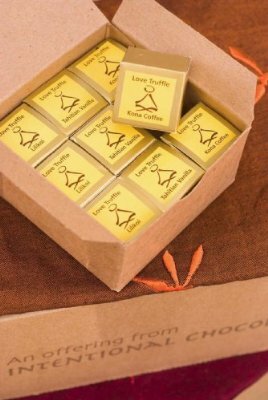 Each truffle comes in its own gold box, in a foil cup. The boxes are a good thing because the truffles are covered in unsweetened cocoa powder and a bit messy. I found it easiest to just pop the whole truffle in my mouth (and, of course, lick the cocoa powder off my fingers). All the truffles are really creamy. The outside shell has a bit of a crunch to it and quickly melds with the really rich, smooth, creamy chocolate center. The chocolate itself is really light – not quite a mousse but still light. But the flavor is really intense, good, deep chocolate. The Tahitian Vanilla was more deep chocolate flavored than vanilla – I just got a hint of the vanilla, really. The Kona Coffee (my favorite) had just the right blend of coffee and chocolate. It was like having a cup of really good joe along with super rich chocolate. My taste buds did the happy dance. As for the Lilikoi, it turns out that “lilikoi” is actually Hawaiian for “passion fruit.” Since the chocolate is 100% vintage Hawaiian chocolate, this made sense to me. I have to say I’m on the fence about the Lilikoi truffle. It’s startlingly tart and leaves me with a fruity aftertaste that reminds me a little of guava. Having something so tart in with the other two sweets is surprising and interesting, I’m just not sure it’s my cup of tea. Next, I tried the Dark Hot Chocolate. Oh man, if my mom served this to us as kids when we came in from the cold, I’d have volunteered to shovel more snow. When I opened the bag, I got the wafting chocolate smell with a hint of chai spices. I like this smell so much, I’m getting happy sitting here with the bag open just inhaling the yummy. I had a little trouble figuring out the servings because the directions use ounces instead of teaspoons. So I just winged it, which worked out fine. You can use hot water or milk to make the hot chocolate – I opted for milk for the full creamy effect. All I can say is: super rich, super yummy, and yes, please, I’ll have another. Last, I dug into the bag of Dark Chocolate Pistoles. Even though these are only the size of a small, flat nonpareil, they are so rich I can’t eat more than a few at a time. Which is fine, because they are really satisfying. If you like good quality dark chocolate, this is for you. I’m thinking it’d be fun to add these to ice cream, use them on top of cakes and cupcakes, etc. Heck, I’d even melt these and use them for some killer chocolate fondue. Overall, I thought this was all really quality chocolate. I’m not sure if the intentions worked, but knowing that people put the effort into placing happy thoughts in my chocolate gave me the warm fuzzies. I think these would make a great gift – not only does the recipient get awesome quality chocolates, but they also get warm wishes, too. hmmm… those pistoles sound like they’d be great for making ganache. Hmm… if infusing chocolate with good intentions really works, could you also fill chocolate with BAD thoughts and send it to your enemies? Yes, you could. But you’d have to be perpared for the karmatic concenquences. Not to mention if you were Bin Laden would you eat anything that was sent from america? ok – i’m going with intentional – and eat the chocolate!!!! I was cruzin the net as I am planning a wedding there in June and wanted to great local chocolate and goodies to put into our Welcome Baskets. love these and will check everything else out…..